Norton Radstock Photographic Society: In search of the Khmer Empire and The Silk Road. RECENT NEWS > In search of the Khmer Empire and The Silk Road. Jill Toman led our club evening on Thursday. Well known for her passion for travel photography, which is fuelled by her insatiable curiosity about other cultures, Jill’s talent for capturing the essence of people and places was there for all to admire. The numerous members that turned out on a wet and windy evening were not disappointed by a commentary that was both entertaining and informative. 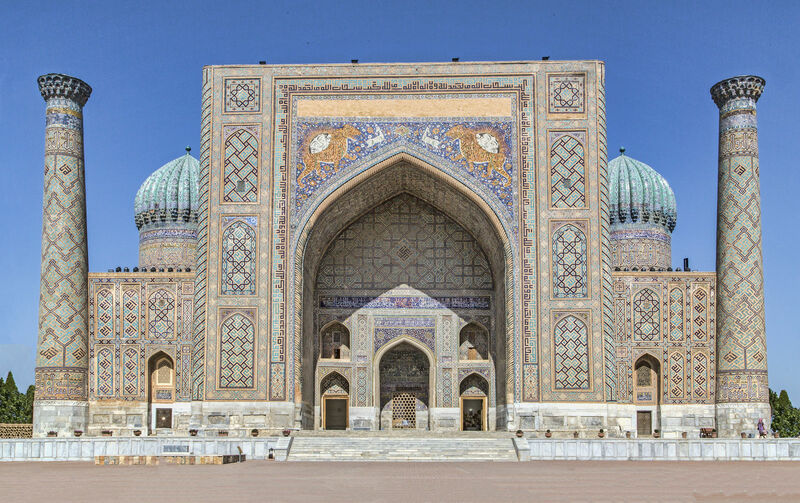 After setting the scenes with brief historical and geographical contexts, Jill took us first to the fishing villages and Royal Palaces of Cambodia and then to the mosques, mausoleums and madrasahs of modern Uzbekistan as she travelled The Silk Road. It was a fascinating journey through what, for most of us, were unfamiliar landscapes, and one that illustrated the widely varying cultures and lifestyles that exist in our world. The Mekong River and Tonle Sap, the largest freshwater lake in SE Asia that dominate the landscape of Cambodia, offered a wealth of subject matter for Jill’s photographic eye. She captured the cacophony of sights and sounds on the streets and in the markets, the delights of the steaming street foods and the innocence of the smiling children precariously travelling the dirt roads on a variety of two wheeled bikes and Tuk Tuks. We were treated to the sight of monks with mobiles, crabs from Kep and Royal Palaces in the rain. We learned a lot too! The role of women in the society that sees them wheeling and dealing in the markets and toiling in the rice fields, whilst the men continue the ancient crafts of wood and metalwork in the old traditions. Not well known for photographing architecture, the surprisingly diverse buildings in Uzbekistan, many restored by the Russians over the years, tempted Jill to rise early to avoid the crowds and capture the crisp, clean lines of ancient mosques and minarets. The beautifully arranged bricks and tiles in blues and orange adorning the buildings at the Unesco World Heritage site in Khiva, contrasted starkly with the simple beauty of kiln dried bricks elsewhere, and the tumbling ruins of temples amidst the invasive roots of ancient trees that are a feature of more rural areas. Not all of it was beautiful- the dust and desolation of what was once the Aral Sea, dammed and diverted by the Russians, now lies desolate and infertile; an ecological disaster of our time. It was a hugely informative evening in which Jill’s photos and narrative captured the unique atmosphere of countries, shaped by history, and alternately influenced by oligarks and superpowers. On show were some stunning images that will no doubt grace the honours boards in a few competitions to come! The Society is delighted that Margot Witcombe has agreed to accept the role of Honorary President, and that the Seymour Cup, awarded for the best print in our annual exhibition, will henceforth be known as “The Witcombe Millenium Cup” in honour of the long service afforded to the NRPS by herself and husband Mike.